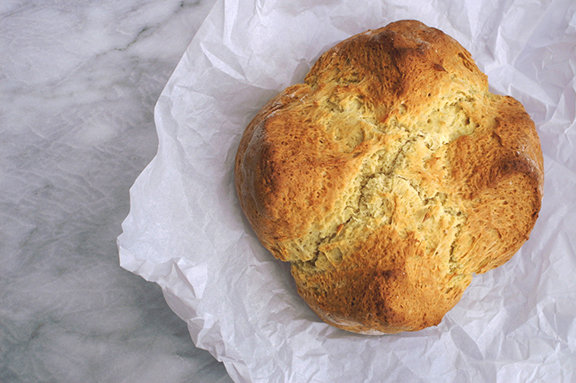 Real talk: it’s not often that I run across a soda bread and think “wow: this is really good.” Often my interactions with soda bread include phrases like “not much flavor,” “a little dry,” and “hmmmm…” No offense to my soda bread fanatics out there (are you out there? ), but it’s just not often done…correctly? with care? I’m not sure which. 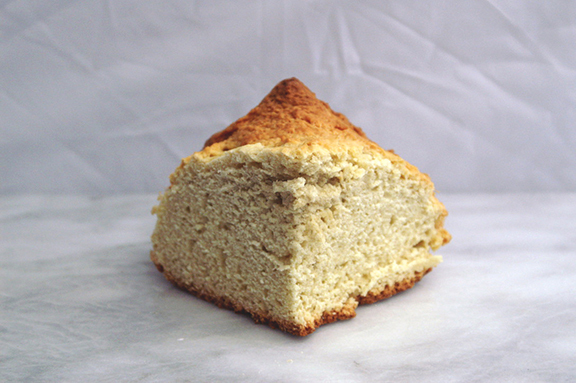 What I do know is that soda bread is often cast aside as something less than it should be; I’m guilty of this as well. This year, I feel like I made a solid choice in my recipe selection. 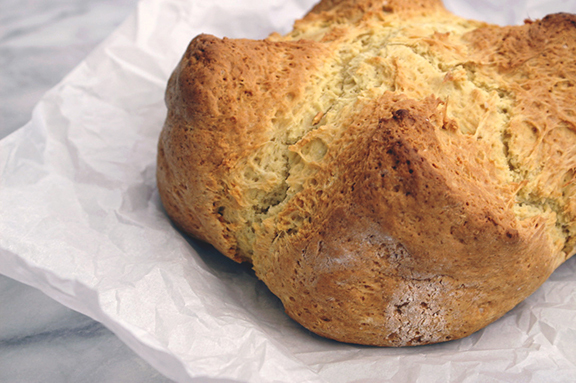 No bells, no whistles, no twists: just a classic Irish soda bread recipe from Ina Garten I ran across in one of those random “Irish recipes for St. Patrick’s Day” google holes. It couldn’t be easier to throw together, it bakes up beautifully, and most importantly, it’s NOT DRY LIKE A BONE. In short? Amazing. So bookmark this for next St. Patrick’s Day (just because I’m blogging again doesn’t mean I’m ready to work ahead of holidays yet.) 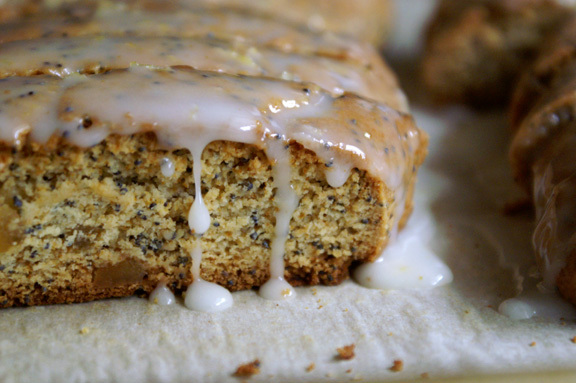 I promise you’ll love it: if you’re a soda bread skeptic like I am, this loaf will change your mind. Adapted from this recipe found over on the Food Network site. Ina uses a mixer for this, which I’m sure works fine: when there’s butter to cut in or a dough to make, I prefer a food processor because it does a good job of incorporating things without overworking the dough, and that’s key to making a bread versus a doorstop. I also completely forgot to grab an orange for the zest, but if you’ve got a teeny bit of orange extract, it works. No currants either, because I live with people who freak out at anything pebbled with dried fruit. It’s a curse, but a curse I try to accommodate. They key to this recipe is a light but firm hand; you want to work things in but not overdo it. This isn’t a smooth dough; it’s craggy. When it’s time to work it into a ball, do it gently, and it’ll be gorgeous. Preheat the oven to 375˚F and line a sheet pan with parchment paper. Combine the flour, sugar, baking soda, and salt in the bowl of a food processor. Add the butter cubes and pulse until butter is cut into the flour evenly. With a fork, lightly beat the buttermilk, egg, orange and almond extracts together in a measuring cup. With the food processor on, stream the buttermilk mixture into the flour mixture until mixture begins to form a ball. Dump the dough onto a well-floured board and knead it a few times into a round loaf. Place the loaf on the prepared sheet pan and cut an X into the top of the bread with a serrated knife – I like to do a pretty deep cut because I like the bread sectioned out widely into four peaks: cutting it on the shallow side will get you that nice fat X shape in the top. Bake for 40 to 45 minutes, or until a cake tester comes out clean. When you tap the loaf, it will have a hollow sound. Cool on a baking rack – don’t leave it on the pan or the steam from the bottom will condense and you’ll have a wet loaf on the bottom. 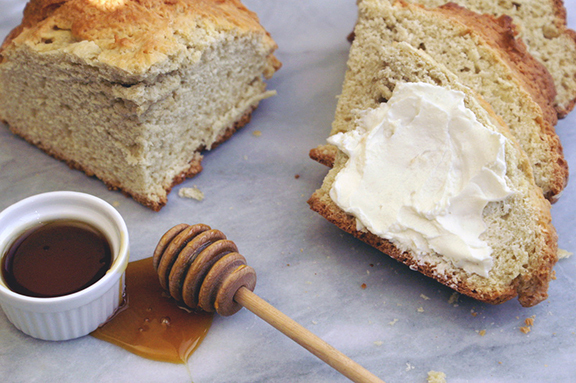 Serve warm or at room temperature with all the butter and some honey or jam; whatever moves you. 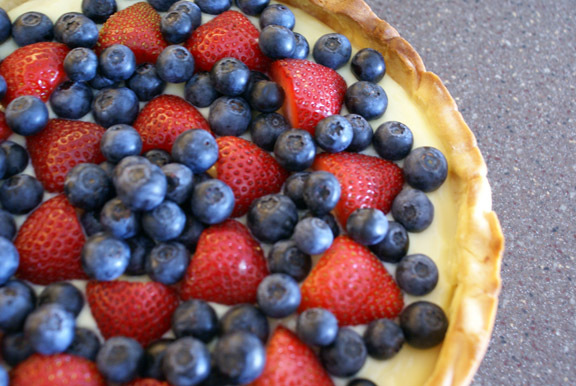 easy fresh fruit + pastry cream tart. 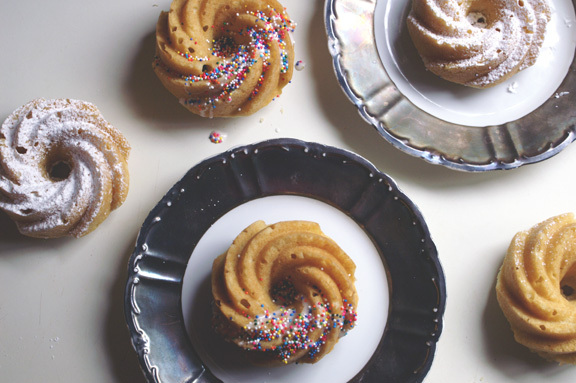 just [tiny] vanilla donut cakes. asparagus + peas with lemon-mint gremolata.